Drivers or woods are the lightest clubs in any golf club collection – they are used primarily to direct golf balls long distances at lower loft angles (between 10 to 15 degrees). Other types of drivers with higher loft angles are used as fairway drivers/fairway woods. Image Credit: Golf Club Against Ball, Golf club (a driver) positioned to hit a golf ball. Close up. 300×200. Wojciech Kulicki. flickr. A lower angle during launch will mean a golf ball will not overshoot its target and the golfer would have more control over the distance and direction of the ball, too. Modern hybrid drivers are available in the market too and if you have the budget for it, you can definitely invest in one or two drivers to improve your overall performance. 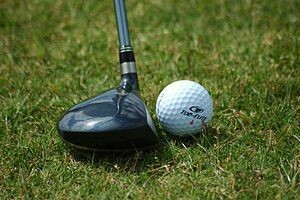 Image Credit: Golf Club Against Ball, Golf club (a driver) positioned to hit a golf ball. Close up. 640×426. Wojciech Kulicki. flickr. Of course, your performance is largely influenced by the number of hours that you devote to practicing your game. An expensive set of golf clubs will provide little or no play value if your basic skillset is unrefined. You need to practice and perform with ideal form to improve your golf driver swing as well as your overall game. Known driver brands that have amassed good following due to their adjustability and versatility include Cobras, Callaways, TaylorMade and Clevelands. As a beginning golfer, it can be very easy to get lost when you are shopping for drivers. Our most important advice for you would be to take everything you see and read with a grain of salt. Focus on your budget and your needs and forget the rest, for now. Don’t overspend on golf clubs as you can get the same enjoyment and practice from a rented set of clubs. Avoid the ‘gear head’ mentality that focuses too much on equipment and not enough skill-building. 1. It is possible to obtain custom-fitting services if you want your golf clubs to harmonize with your grip and height. Expect such golf club sets to cost more than $1,000. If money is no issue, then by all means, get clubs that suit your height. However, we do remind everyone that you can still play a good game of golf by following the best practices, even if you don’t have the most expensive golf clubs in the neighborhood. 2. COR or coefficient of restitution is a big issue in professional golf and there are golf clubs that have been tagged as “illegal” because their COR is higher than what the PGA prescribes for the game. 3. A golf club with a high degree of bounce is more suitable for putting in loose sand environments. Inversely, if you are trying to slice a golf ball out of wet grass or wet sand, a lower level of bounce is required. 4. Woods that have better offset have a higher chance of helping you improve your swing. Offsets are tiny adjustments in the positioning of the club head, allowing you to make contact with the surface of the golf ball half a second (or less) before the rest of the golf club reaches the target spot on the green. Offsetting of golf clubs has become more technical in recent years, thanks to the continuous demand for more accurate and powerful clubs. More INFO: Golf Swings, Beginner Golf Swing Tips, Proper Golf Swing, Best Golf Swing Technique, Swing Speed << HERE! Link to this article by using the following URL: http://uniqsource.com/leisure/golf-swing-driver/ COPY and PASTE! Images Licence: Creative Commons CC Attribution 2.0 Generic (CC BY 2.0).